Linked Data is playing an increasingly significant role in the field of cultural heritage. 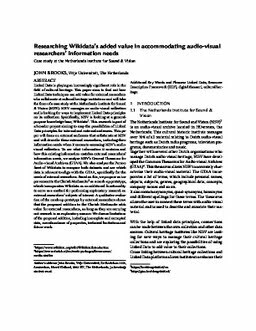 This paper aims to find out how Linked Data techniques can add value for external researchers who collaborate at cultural heritage institutions and will take the form of a case study at the Netherlands Institute for Sound & Vision (NISV). NISV manages an audio-visual collection and is looking for ways to implement Linked Data principles on its collection. Specifically, NISV is looking at a general purpose knowledge base, Wikidata. This research is part of a broader project aiming to map the possibilities of Linked Data principles for internal and external audiences. This paper will focus on external audiences that collaborate at NISV and will describe these external researchers, including their information needs when it comes to accessing NISV’s audiovisual collection. To see what information it contains and how this existing information matches external researchers’ information needs, we analyse NISV’s General Thesaurus for Audio-visual Archives (GTAA). We also analyse the Person facet of Wikidata to compare both datasets and see which data is relevant to align with the GTAA, specifically for the needs of external researchers. Based on this, we propose an improvement to the Clariah Mediasuite as a mock-up prototype, which incorporates Wikidata as an additional functionality to serve as a method for performing exploratory research on external researchers’ subjects of interest. A qualitative evaluation of the mock-up prototype by external researchers shows that the proposed addition to the Clariah Mediasuite adds value for external researchers, as long as they are carrying out research in an exploratory manner. We discuss limitations of the proposed addition, including incomplete and corrupted data, overabundance of properties, technical limitations and future work. Brooks, J. (2018, August). Researching Wikidata’s added value in accommodating audio-visual researchers’ information needs. Vrije Universiteit Amsterdam.